About Our Company | Squeals Landscaping, Inc.
“Dependable, Reliable, and Professional Service!” These are only a few of the phrases that people use when talking about Squeals Landscaping. With more than 25 years of experience in Michigan, we take pride in giving our customers service, above and beyond that of our competition. We are licensed by the State of Michigan & Department of Agriculture. Squeals is fully insured with worker’s compensation and liability coverage. We provide written warranties for all our work. We offer a number of free services including estimates, consulting and phone evaluations. It all starts with our sales department! All salesmen have a minimum of 20 years of landscape installation experience and were crew supervisors for at least 10 years. They understand all phases of construction. They can quickly lay out jobs and concepts on-site for clients. Our salesmen work with the design team to provide the client a picture-perfect plan. Finally, the salesmen communicate with the project manager through completion of the job. The customer deals with the same salesman from design through installation, so we get to know your specific landscape needs. Our in-house design team has unique ideas that are functional and economical. 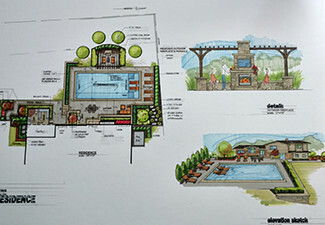 The design staff consisting of our draftsman, designer and landscape architect work directly with our sales staff to create a plan that is perfect for your property. Our installers work under the direct supervision of the project manager. They are trained to pay close attention to specific details on the job. Squeals creates amazing landscapes that are a true work of art. You will not have to take time out of your busy schedule to worry about your landscaping; your home investment will grow and your new landscaping will be enjoyed for decades. At Squeals we start with complete design services including professional blueprints, watercolors and permit assistance where needed. Our trained sales staff will come to your site and give free customized estimates to meet all of your landscaping needs. We specialize in design, construction and installation of new and existing projects. Squeals Landscaping always provides our own employees, materials and equipment to complete your project fast, efficiently and at competitive prices. All of our work includes full warranties backed by a company in business for over 25 years. Our hand-picked plant materials are selected from the highest quality growers throughout the United States. 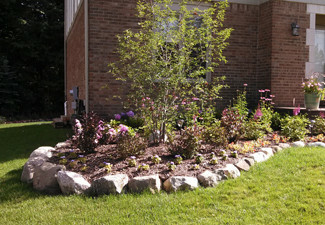 After meeting with our representatives, you’ll see how easy and affordable a new landscape can be. Squeals Landscaping also has a trucking division and does demolition, excavation and land balancing work for all your construction needs. In the winter, we do commercial snow removal and salting for large parking lots and condominium complexes. We can work with builders, developers and project owners. Working as a team with other tradesman on site, we are confident our commercial crews can complete a full job on schedule meeting the most demanding deadlines. Call us today to schedule your free consultation!